Nearly all of the outboard motors suited for inflatable boats are four-strokes, a technology renowned for its efficiency, soft voice, smokeless exhaust and fuel sipping manners. So how do you choose the optimal motor? The answer to that question depends on how much horsepower you need. 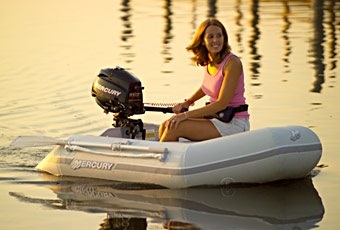 Every inflatable boat is rated for maximum hp and weight, ratings that state in no uncertain terms exactly how powerful of a motor can safely be clamped to the transom. The ratings are the product of a tried and true USCG formula. Keep in mind the rating refers not only to horsepower, but also to weight. While not exactly unlawful to hang a bigger motor on the transom, your liability insurance may become invalid if you do. And while overpowering is guaranteed to move the boat at faster speeds, it would do so at the expense of handling and stability. The greater an engine's horsepower, the larger its physical size. So naturally it follows that means the more it weighs. Excess weight on the transom upsets a boat's balance and makes it hard to handle. Simply put, the bump in speed is not worth it. In the beginning we said four-strokes are marvels of modern efficiency. But there is a price to be paid. They're 10- to 20-percent heavier than the obsolete, conventional two-strokes they replace. As a result, the USCG rating may not exactly match reality. So tally the weight of the motor, the fuel, your own weight, plus the weight of passengers and cargo. Match the total against the inflatable USCG maximum weight rating. You may be better off with a bigger boat even if the number is marginal. Or, you may have to downsize the engine. When water scorching acceleration is not a priority, you can buy a motor less powerful than the inflatable's USCG rating. Smaller motors cost less money to buy and burn less fuel. Smaller means a lighter weight, which makes them easier to wrangle around on deck or into a car trunk. But there is a limit as to how small is still efficient. An outboard rated less than 20-percent of a boats maximum rating may not be able to get the boat up onto plane with even one person on boat. Even if it does climb onto plane, extended bow rise is hazardous. You're blind to whatever's in front of you for several seconds. On a more practical note, slower boats mean longer passages from the mother ship to the dockside restaurant, or an unacceptably long haul to explore a secret cove. There is another side to the argument. Sometimes it makes perfectly good sense to drastically underpower an inflatable. 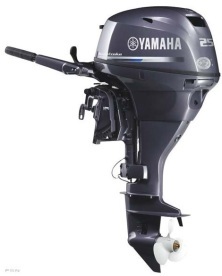 The smallest of the small outboards are very lightweight which means they're significantly easier to wrangle. As for performance, a tiny two horse that moves a ten foot RIB at a mere two or three knots is still faster and easier than rowing. The boat never planes and you don't care. It sips fuel at a miserly rate and can be stowed in a very modest space. Sometimes bigger is just heavier. Another motor matching problem occurs when you have chosen what seems like it should be the right motor, only the boat can't quite climb over the bow wave and scoot up onto plane. Usually the culprit is a new wave four-stroke and an old design inflatable. While four strokes are state of the art technology, hp to hp, they're heavier than the obsolete two-strokes. To compensate the latest model inflatables boast extended rear cones for extra buoyancy to better launch a boat onto plane. For this reason it is imperative to test drive a boat with the exact brand and horsepower you intend to buy. You'll quickly discover handling manners, good and bad, and decide whether the boat and motor package is an appropriate choice. Compare different brand engines and their weights. Sometimes changing colors of the motor solves the problem. Also important to know, some inflatables require a standard shaft length (15-inches) lower unit, while others require a long shaft (20-inches). The longer the shaft, the more expensive the motor, but not by much. Regardless, shaft length is not an option. A too short motor can't bury its propeller deep enough below the water to perform up to its fullest potential. What about motor options? Electric starting is an undeniably welcome feature on a sport boat with a console, steering wheel and helm chair. 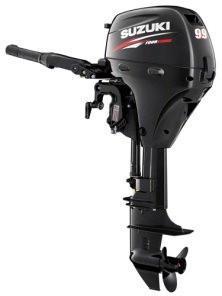 Some electric start outboards even include the luxury of an electric choke. But it's really an unnecessary option on anything 25 horsepower and below. Besides if the engine won't start on one or two pulls of the starter rope, then something is the matter. Should some fuel dock expert remark that the engine is flooded, that’s no excuse for it not starting. There’s something the matter with the ignition or the fuel system. There's more to know. Whenever you run the boat at night, you need running lights. Many motors, even those without electric starting, have an alternator option good for powering running lights. It's infinitely more reliable and less hassle than D-cell batteries. Then there's the art of the deal. Depending on the locale, smaller motors are often discounted for the simple reason dealers must stock a certain number of them in order to get a bigger allotment of V-4s and V-6s. That's where they make their big money. Other times the motor you want may be such a red hot seller that you have to backorder one. Comparison shop not only brands, but also dealerships. Don't forget the internet. Warranties are another critical issue. Most four-stroke warranties run for a term of three years. But special deals come and go with the seasons, offering special warranty extensions or extended service contracts included for no extra cost, or for very little money. Finally, just as important as purchase price is the dealership and its service center. How is your rapport with the service manager? Are the technicians up to date on the latest diagnostics? Ask to see credentials. Is the shop neat and orderly. 1. Keep fuel fresh and clean and dry (no water in gas). Sometimes hard starting is due to moisture in the fuel tank. Simply dose the fuel with a can of special additives that absorbs the water. 2. Routinely check the propeller for fishline wrapped around shaft. If you don’t remove it, it burrows through the propeller shaft seal and the oil leaks out. 3. Change the oil and oil filter after 20 hours then every 100 hours or at least once at the end of the season. Four strokes are very sensitive to clean oil. Dirty oil destroy crankshaft and connecting rod bearings. 4. Change gear case oil on schedule. Once a year keeps fresh oil lubricating gears and bearings, extending life. 7. Fog the cylinders if the engine will remain dormant for more than a couple of weeks. Fogging oil is sticky and vaporous and protects against rust. 8. Bolt the motor to the transom. Don’t rely on the clamp screws. Clamp screws are notorious for unwinding and letting the engine hope off into the water. 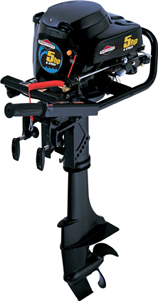 Many outboard s include a bolt for permanently attaching them to the transom.